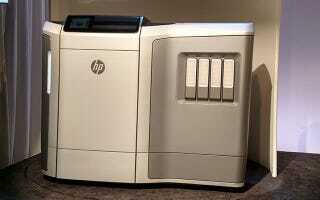 Today, HP announced a new technology and 3D printer it thinks is going to revolutionize the industry. This massive machine isn't meant to sit in your home, but rather be a new piece of tech in the arsenal of additive manufacturing. Using a new technology that HP calls "Multi Jet Fusion," the company says printing something that would have taken days will now only take hours. The company says this new printer will radically reduce time and cost for 3D printing. Multi Jet Fusion works by spreading powdered material across a build area. Then, a "fusing agent" is applied using a paint bar and at the same time a detailing agent is applied for high definition. Those separate "agents" are then fused together. All of this just creates one layer of whatever object you're building, so like any other 3d printer, the object is eventually built layer by layer. Here's a HP rep next to the printer. Like I said, it's a big boy. The printer uses a high-resolution print bar, it can also jet 350 million drops per second at 21 micron precision. For comparison, MakerBot's Replicator 2 comes in at only 100 micron resolutions with other personal printers reach upwards of 50 microns. HP says what would take a normal 3D printer 83 hours to make, this new HP printer will only take 3 hours. However, MakerBot and the myriad other 3D printers that have been created for personal use in this brave additive manufacturing future will continue to be go-to consumer options for in-the-home printing. But really its not so much the product, or its neat new way of printing, that's exciting here. It's more that HP, one of the biggest hardware printer companies, has finally taken a step into 3D printing, and as its executive Vice President Dion Weisler reiterated several times throughout the company's morning press briefing—it's the future. Here's a look at some things printed by HP's Multi Jet Fusion printer.